You all know that Google has taken HTTPS or SSL Certificates on Websites as a Ranking factor. This means Websites having SSL installed will have a small ranking difference comparing one without SSL certificate. Also, Having SSL installed on your Website is a must. Because a lot of people use the Google Chrome Web Browser to access the Internet. In the recent update of Google Chrome, they have made a great change in terms of security. Site without having HTTPS will be marked as Not Secure near the URL on Address Bar. Screenshot below. So, having SSL Certificates installed on your blog is a must. Maybe in future Google will make SSL Certificates an unavoidable factor in Search Ranking. Now, you might have understood the importance of enabling HTTPS on your blog. It’s a must. 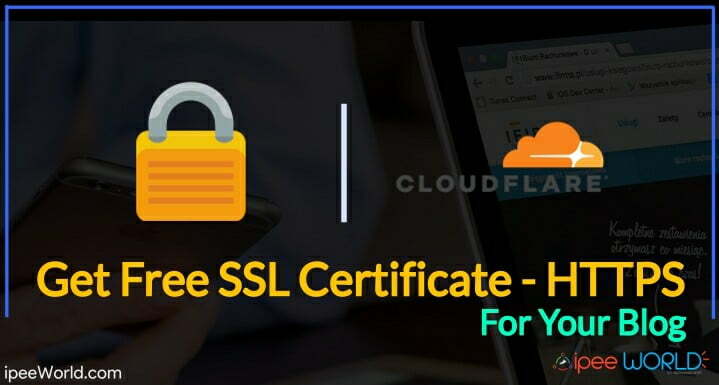 So, today in this article we will discuss How to install Free CloudFlare SSL Certificate on any Blog. Without further ado let’s get into it. Now, Add your Domain to CloudFlare, You can follow the on-screen instruction from the page itself. Now, Make sure that CloudFlare is successfully installed on your blog. Now, we have installed and activated CloudFlare on our Blog, next is to configure it and add Free CloudFlare SSL to it. So, let’s see how to Install and Configure Free SSL from Cloudflare on your blog. From the SSL section, click on the drop down menu and select Flexible. Wait for some wait until you see a status in a Green Box “ACTIVE CERTIFICATE“. That’s not all. We need to configure them our blog for SSL. Now, we have created an account and activated CloudFlare SSL on our blog. Now, we need to configure it on our Blog. So, that you don’t get any issue with mixed content. Below, I will share how to configure SSL from CloudFlare for WordPress and Blogspot/Blogger Blogs. If you are a Blogger/Blogspot User, then go to Blogspot section right after WordPress section. We needed to configure some important plugin in WordPress to make it work exactly the way we want. Now, from the Plugin login to your CloudFlare account and setup the plugin with your site. Then Install the CloudFlare Flexible SSL Plugin from the link below and activate it. Now, Install the WordPress HTTPS (SSL) plugin and activate it from the link below. Now, Open the WordPress HTTPS (SSL) plugin settings page. Select Yes option for the Proxy settings (Screenshot below) and Save Changes. Now, we have setup SSL on our WordPress Blog, too. Then jump to Adding Page Rules section. And Blogger users read on. Find the </head> tag and paste the below given code right above it. Replace yourdomain with your Blog Address no need to add the extention. Now, paste the below given code right below the <head> tag. Replace yourdomain.com with your Site address and BLOGID with your blog ID. Now, let’s edit our Robots.txt file. Replace the sitemap URL in the Robots.txt file to the HTTPS version. We wanted to redirect our site from HTTP to HTTPS version. So, let’s add Page Rules in CloudFlare for that. And Now, we are done. We have successfully activated free SSL from CloudFlare on our Blog. What’s next? Now, Change the Protocol of the site in Google Analytics as well. In the default URL, Select HTTPS from the drop down. That’s it, We have successfully enabled SSL, Free HTTPS on our Blog. We are all good to go. Adding HTTPS to our blog is a must now. So, do it as soon as possible. Be sure to comment down below, if you face any issue or something. I will help you at the soonest. cant it be done automatically with BlogSpot with own domain? or do we have to edit the URLs with the SSL?